Your computer screen or cash register is an integral part of your business. It keeps track of your sales for the day, your running inventory, and could possibly track employee productivity. Now you can keep your computer and cash register on the Metal Framed Well Top Register Stand with Maple finish, tying together all of your metal framed display units. Our register stand contains two adjustable rear storage shelves with finished sides, which is great for keeping tools, supplies and store essentials on hand. Additional features include long wearing melamine maple laminate and satin finish with anodized aluminum framing. Crating is included in the price to ensure secure shipping. 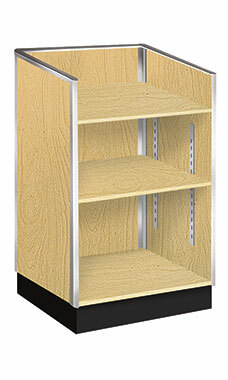 Overall, the register stand measures 38"H x 20"D x 24"L. Available for immediate shipment.